These are the first cupcakes I have made using coconut flour. The only other thing I have made with coconut flour is angel food cake. I thought it worked pretty well. 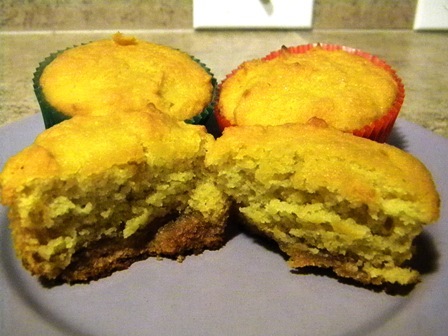 The cupcakes were nice and light with a more delicate flavor than almond flour. It definitely makes a nice white cake. This recipe has a peanut butter bottom. It was really good, no need for frosting at all. Mix dry ingredients together in a small mixing bowl. In a large mixing bowl beat the rest of the ingredients until smooth. Slowly add dry mix. Beat at medium speed for 3 – 4 minutes until creamy. In a small bowl stir peanut butter, honey, and vanilla together. Line cupcake pan with 10 cupcake liners. Scoop about a tablespoon of the peanut butter mix into the bottom of each cupcake holder. Pour 1/4 cup of the cake batter over the peanut butter. Bake for 20 – 24 minutes until toothpick inserted in the middle comes out with only a few crumbs. You can also lightly touch the top of the cupcakes – they should not be wet. Allow to cool in pan for about an hour before removing. Going to visit my peanut butter loving in-laws soon. Think this might be what I bring with me! Hi there, I love this cake! Instead of butter, I used organic e.v.o.o. and I added 1 cup of coconuts flour instead of half a cup as the batter got more watery with the use of oil. It came out fabulous and I ended up making it three times in two days! I am a Candida Albican and I am following GAPS and SCD diet to heal my guts and this cake is the most delicious one I had in a while! Thanks so much. It is healthy and so yummy!! I am going to try many more of your fabulous recipes! !